There is a version of Googolplex which would be a perfect novelistic interpretation of the wonder and strangeness of the many worlds interpretation of quantum mechanics. It is not the version in this universe. The opening words set a high bar—"In the beginning" (p. 1)—whilst the cosmic language which follows made me think of Olaf Stapledon's peerless novels. This first section opens up such topics as the strangeness of the universe, but much of this book is about our protagonist's interior universe—a space which Stapledon rarely visited. This sense of strangeness is extended through the description of the technology and the space ship itself. The outer hull was grown from Jack's own tooth enamel. He lay on his little bed . . . Two feet from him was hard vacuum. The nature of this biotechnology is fascinating. After the upheavals which ended the oil age, a new, DNA-based technology has asserted itself, enabling developments far beyond our capabilities. I was disappointed that the basis of this technology is dreams sent by beings which communicate in pictures, that "[t]he picture or dream could often be a solution to a problem. A blueprint for a biological machine" (p. 8). Still, this proved indicative of the novel as a whole, which is a form of dreaming into being. Frustratingly, we first have to endure several chapters establishing a human colony on the world of Shylock. The colonists go through the usual travails in the usual way, with good years and bad—but there is no perceivable depth to any of it. There is little about the group, and nothing about the world, which gives any flavour of the reality, the intensity of such an enterprise. Paralleling this is a growing relationship between our protagonist, Jack, and a woman called Liya. It is shown as utterly inevitable; the other colonists expect them to end up together and Liya ensures that this happens despite Jack's seeming vagueness. It feels like Liya is Jack's reward simply for being the protagonist. And then, after several chapters of struggle for the colony and the reader, Jack decides he doesn't like it, abandons Liya, and returns to Earth. It is very hard to see the point of this section, as the novel seems to begin again in chapter five. Jack discovers that he has blanked out most of his memories, that he is far older and wealthier than he thought. He concludes that his uneasiness on Shylock was from memories haunting him and decides to reintegrate his past, despite the doubts of what memories he ran away from. The trope of clearing away an excess of memory in an artificially long life is familiar but the method used here is intriguing. Memories can be offloaded to copies of the original brain, where they remain stable and can be reintegrated later. This provides ample opportunity to philosophise on the nature of memory. He was aware that as soon as he replayed [memories], virtually, to experience all physical sensations and feelings, they would become part of his present consciousness. Even during the replay, his present thoughts and feelings would influence his experiences. Afterwards, he would remember the recorded memory, he would remember the memory of it, and what had once been fresh and original would slowly deteriorate. The technology of this era allows Jack to relive his life as if for the first time. This provides an opportunity to tell the human story of seven centuries from our own time, but the history feels like set dressing, a default future for a more interior story. The modern era started with the appearance of the multis, beings which have taught humanity the new, DNA-based technology. Jack is lauded as a DNA engineer of great skill, but he applies little conscious effort. Our protagonist simply dreams the result he wants and it comes. As the multis are explained, so is the book's title. Each multi is a projection into this single universe of the sum of a person from across many universes. And the count of the possible universes is "every possible state and position for every particle in every Planck time, in every universe. Googolplex, he thought, 1 followed by a googol of zeroes: googolplex raised to the power of googolplex" (p. 107). Of course, such numbers are not really parsable. Johansson knows this, so the second half of the book is an attempt to make such infinities more real. Jack discovers in his memories the sorrow which has shaped the rest of his life—Rachel, the perfect woman and the supreme sadness of their not being together. There is a meditation to be had here on how corrupting it is for something which happened in the second decade of life to still be controlling Jack's actions many centuries later. Perhaps there is a human need to become different people over the course of an ordinary lifespan, a need which ought to intensify over a much extended span. Still, whilst the book encouraged me to think about these things, I don't find much sign of them being present in the words on the page. Instead, this core event is a tool Johansson can use to express the multiverse. Jack learns quickly that Rachel, all these centuries later, is still alive but has no (has not kept any) memory of him. But he knows there are other versions of her in neighbouring universes. He dedicates his life to finding the Rachel he wants, searching the other worlds, with the occasional aid of a multi who watches over him. As he samples the multiverse, he begins to understand how impossible is the task of seeing all the variations, but he also comes to the certainty that some alternate holds his dream woman. The rest of the book attempts to express the weirdness of quantum branching reality, of a googolplex of possibility. This peculiarity of character stains the space around it, leaving no room for enlightenment. If Googolplex is a study of obsession in a science fictional setting, it succeeds in making this reader uncomfortable. 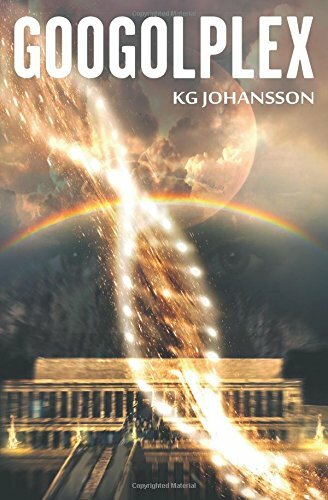 However, the internal clues don't really support such a reading and there is little to recommend it as a work of multiverse exploration, and this reader is not about to go looking for better versions in alternate worlds. Duncan Lawie is delighted to return to being opinionated in public after two years' careful silence as an Arthur C. Clarke Award judge. His work also appears in Media Culture Reviews .